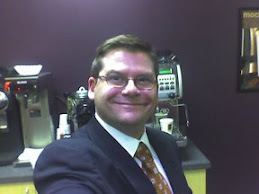 I had such a great time in Wausau, WI with Tom and the gang...there are quintessential BIGGBY operators. Nice pic of Tom with the big hidey ho wave at the end--nice touch! I'm sure it was a fun visit! Great job Tom bringing BIGGBY to Wausau. You do know how to work a room. Great to see all of the great baristas that are still with you. Hello to all of them too. Wait! Hold on!! Did I hear that right? Is BIGGBY COFFEE my "happy place?" Just wondering. 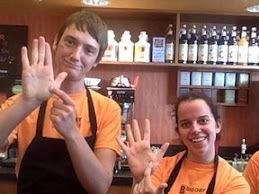 To Tom Belongia and all the Biggby associates in Wausau. You guys are doing a super job. The store looks beautiful and obviously you make a lot of people happy every day. You even survived a Biggby Bob sighting! Have a great holiday season and 2010 is going to be an awesome year. Especially at Biggby Coffee!